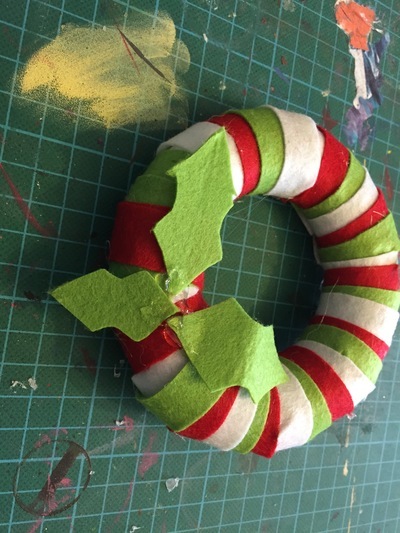 This activity is for older children because it uses a hot glue gun. 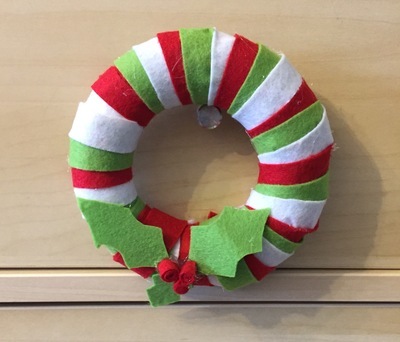 It makes a gorgeous, colourful wreath that you can hang on a Christmas tree. 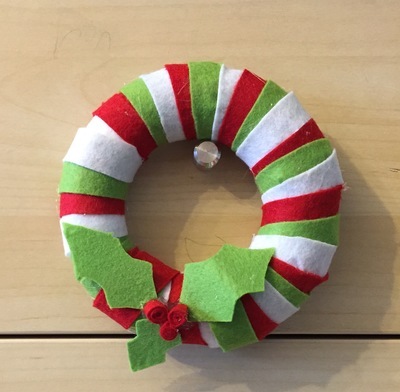 You could use a larger polystyrene ring, and bigger sheets of felt to make a wreath big enough to hang on a door. 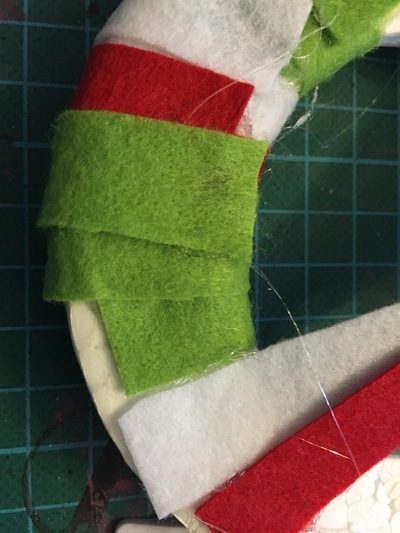 Cut the felt along the long edge into strips about 1 cm wide. You will need about 12 strips of each colour to cover this size of ring. 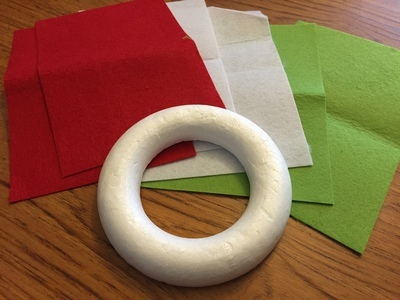 Using the hot glue gun, squeeze a small amount of glue on the wrong side of the ring and affix your first piece of felt. You can affix these three at a time, as shown the picture, or just do it one at a time. Wait a moment for it to dry, and then wrap it round the ring. It should wrap round twice. Squeeze some more glue to fix the felt in place, again on the wrong side of the ring. Trim the extra ends of the felt. Repeat this all round the ring, overlapping the colours so you can leave a small strip of each showing, like a candy cane. When you have completed the ring, set it aside. Take a sheet of green felt and fold it in half. Cut one side of a holly leaf, which will allow you to unfold it into a full, symmetrical leaf. Repeat so that you have three leaves. Using the hot glue gun, affix the leaves to the front of the wreath, this will be the bottom. 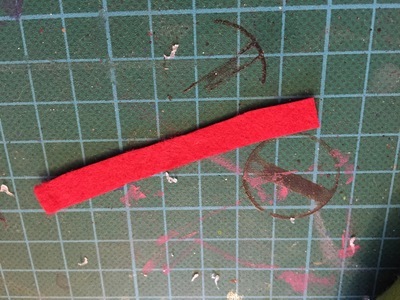 Cut 3 short strips of red felt, about 5cm long and 0.5 - 1cm wide. 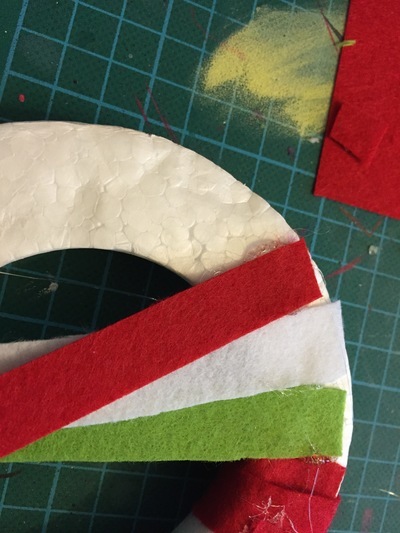 Roll up the red strips and stick the ends with the glue gun. Fix these rolled up strips into the middle of the holly leaves to make berries. Hang up the wreath and admire! 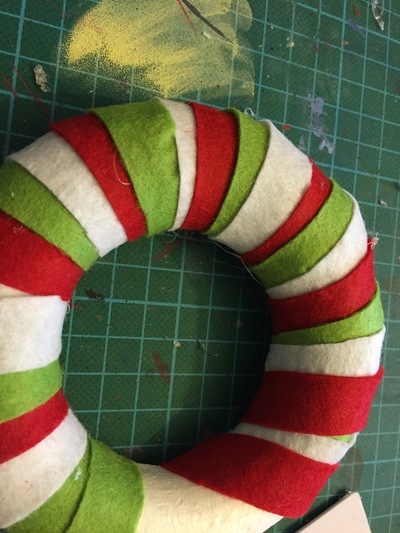 The finished Candy Cane Felt Wreathe: ready to hang on the Christmas tree!